Hip Hop Chess Federation releases theme song! Adisa Banjoko of the nascent Hip-Hop Chess Federation is still excited about the marriage between hip-hop and chess. He already has his third event on the table and this one will differ in that there will be a structured format for playing as opposed to "freestyle" playing. As part of his marketing campaign, several artists have put together tracks with chess themes including an official HHCF theme song by T-Kash. It is an upbeat tune that uses several metaphors for chess being a training ground for life lessons. There is also a nice radio-like promo at the end. Others tracks have been in a rotation on the myspace page. This fusion will certainly open up a ton of possibilities in terms of new music themes and possible a way to rescue wayward youth from the poison packaged as "gangster rap." What is important is that hip-hop chess and its supporter make a foray into the international chess world. With the four tracks that have been produced so far, there may be a chance to cut a CD! 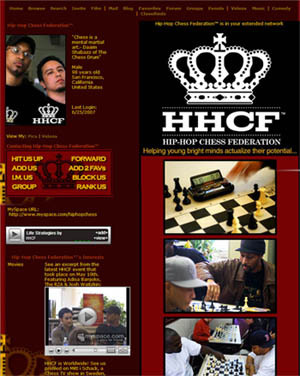 The Hip Hop Chess Federation has set up a myspace page with good content including videos and chess-inspired music. Listen to one of the tracks here!